My Mom’s Fruitcake has been generously shared by Libby Myrick. It’s become a family favourite and the recipe was of course Libby’s mom’s, which has been passed on for all to enjoy. 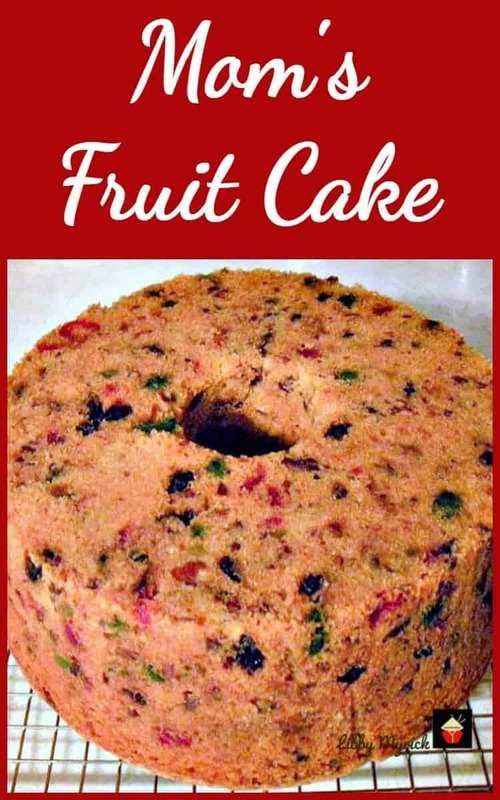 It’s certainly a lovely cake, full of all the goodies you would expect in a fruit cake, and would be perfect for use as it is or as a Christmas Cake. I use my angel food cake pan that is 10 x 4 inches. It is in two pieces which makes removing this much easier. You can use any pan just be sure to keep an eye on the cook times as they may vary. 1. Sift together flour, baking powder and salt, Reserve 1/4 cup of this mixture. 2. Cream together butter and sugar until fluffy. Add eggs, one at a time, alternately with milk, and flour (save 1/4 cup of the flour), beating well after each addition. 4. Spread batter in greased and waxed paper-lined tube pan. 5. Bake in 275 F oven 2 hours 45 minutes or until done. 6. Cool in pan 30 minutes. Remove from pan and cool on rack. I found out the hard way if you are using a pan that is in two pieces to put a drip pan under it as the butter drips out as it bakes. 7. 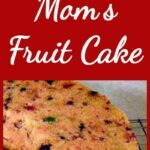 Wrap fruitcake tightly in foil. Store in refrigerator up to 4 weeks. Mom always stored hers in the cold attic a month before Christmas. We liked it just like this but if you want to glaze it here is the pineapple glaze recipe that came with the recipe. 1. Combine 1 cup confectioners sugar and 2 tablespoons pineapple juice. Mix until smooth. 2. Don’t add this until ready to serve. To serve prepare glaze. Frost top of cake letting glaze drip down sides. 3. Decorate with pecan halves. Sift together flour, baking powder and salt, Reserve 1/4 cup of this mixture. Cream together butter and sugar until fluffy. Add eggs, one at a time, alternately with milk, and flour (save 1/4 cup of the flour), beating well after each addition. Spread batter in greased and waxed paper-lined tube pan. Bake in 275 F oven 2 hours 45 minutes or until done. Cool in pan 30 minutes. Remove from pan and cool on rack. I found out the hard way if you are using a pan that is in two pieces to put a drip pan under it as the butter drips out as it bakes. 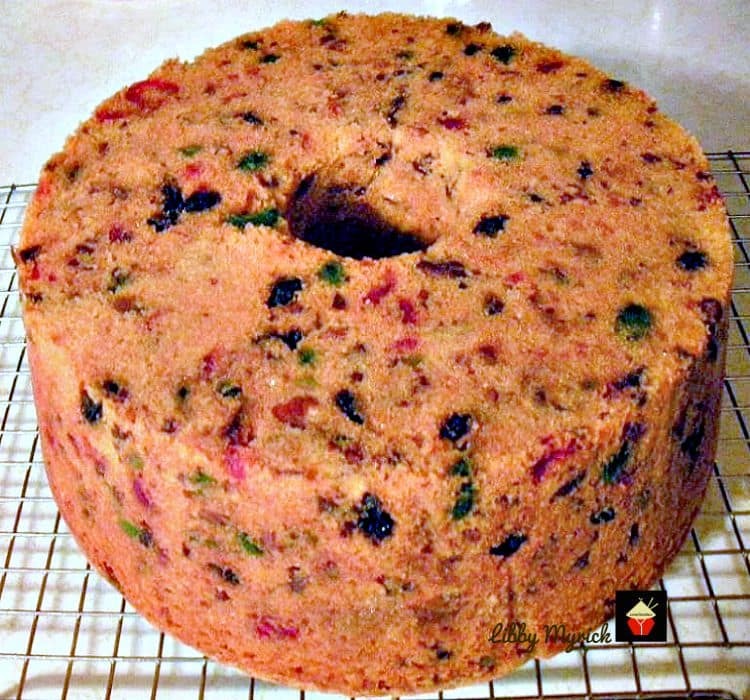 Wrap fruitcake tightly in foil. Store in refrigerator up to 4 weeks. Mom always stored hers in the cold attic a month before Christmas. We liked it just like this but if you want to glaze it here is the pineapple glaze recipe that came with the recipe. Combine 1 cup confectioners sugar and 2 tablespoons pineapple juice. Mix until smooth. Don't add this until ready to serve. To serve prepare glaze. Frost top of cake letting glaze drip down sides. Hi Dorothy, I’ve emailed you the size so please do check your junk folder incase my email ends up there! I see no option to print this recipe out or am I over looking it? Hi Joy, far left hand side of the page is a vertical column of icons, select the red + and there you will see a print icon. There’s also a red ‘Share’ button just under the main picture, again, click that and there you will also find a print option. Please only select the printer icon and NOT the print friendly icon as that one is not working at the moment. I am waiting of the print company to fix it.